With the debut of the next iteration of the iPad nearly upon us, some of Apple’s big-box retail partners are starting to clear out their iPad 2 inventory in preparation for its arrival. On Sunday, Best Buy began offering an unusual $50 discount on all iPad models, dropping the price of the entry level Wi-Fi-only iPad to $449.99, and the price of the high-end 64 gigabyte Wi-Fi+3G device to $779.99. 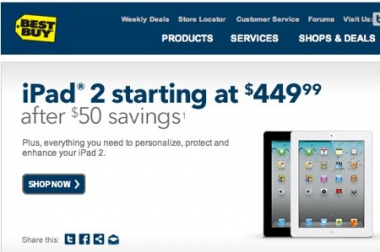 And Best Buy isn’t the only retailer looking to clear out iPad 2 stock ahead of a refresh. Earlier this month, Meijer, a regional big-box retailer in the Midwest, knocked $70 off the 16GB iPad 2 with Wi-Fi, dropping its price to $429. Meaty discounts, both of them, but better to offer $50 or $70 off now than be forced to hand out even steeper discounts after the iPad 3 debuts.